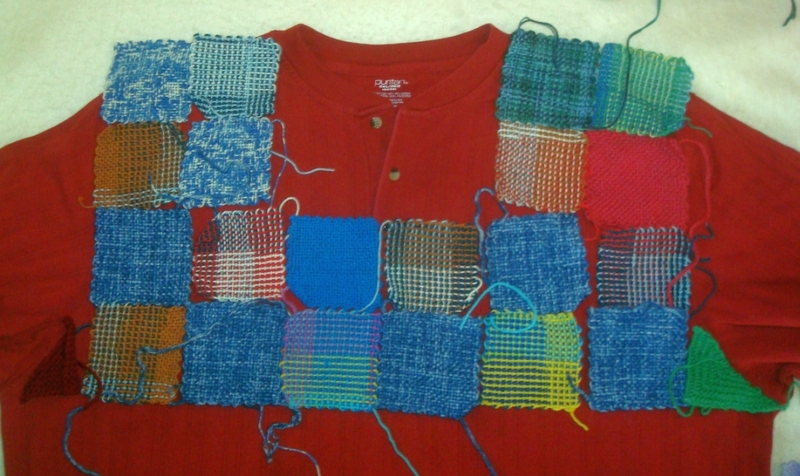 I have all the squares woven for the tunic but…! I am still trying to figure a way to add sleeves. I really like it all brown but I also really need sleeves. I had intended to beg for yarn but I don’t want to wait. It’s hell when you can’t get everything you want Right Now! Still fretting over what to do but it is good to go, if I decided to do it. Robin has been a good boy today, too, staying on his kitty blanket and off my project. It’s still trying to snow. Temp has been slowing dropping all day. It’s (nearly) April fur heaven’s sake! Okay, but I don’t think my initial guesstimate was too far off. I scooted the cat over and laid them out on the bed. Laid the pattern out over them and came up with a couple modifications. 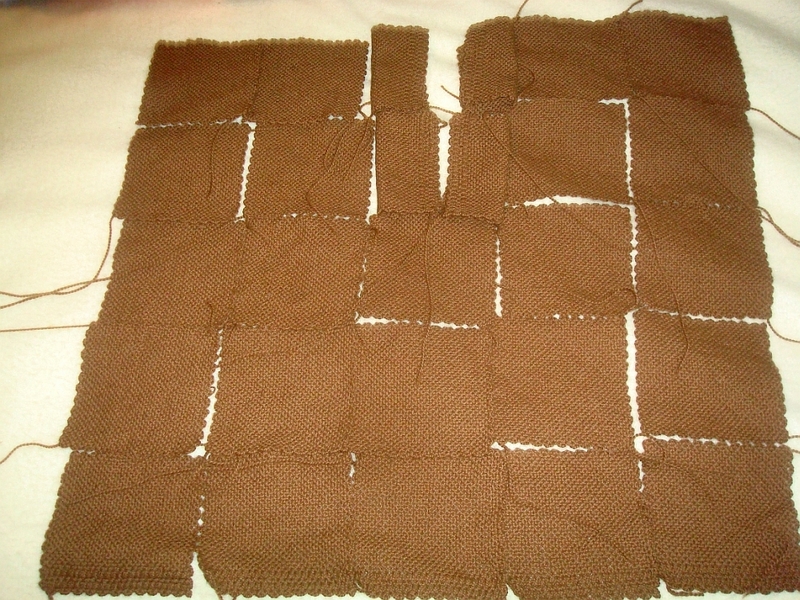 Not entirely happy with it yet, but I still have more squares to weave so time to mull it over. I think I may yet rearrange the upper bodice. I’ll have to see how it fits once I get most of it assembled. One thing I have learned during this design it myself era is never weave ends in until you are Absolutely Sure it’s right. It is really difficult to find ends if you have to frog once you’re done a proper job of weaving them in! 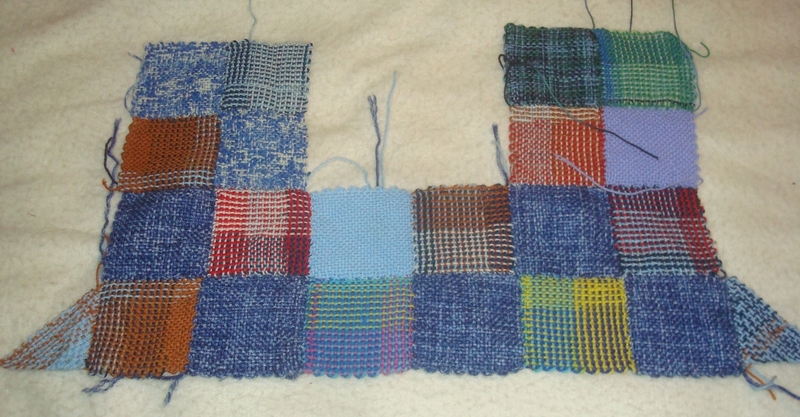 Okay– back to weaving while it’s still raining and too wet for gardening. But meantime I thought I’d chat a bit about ideas. 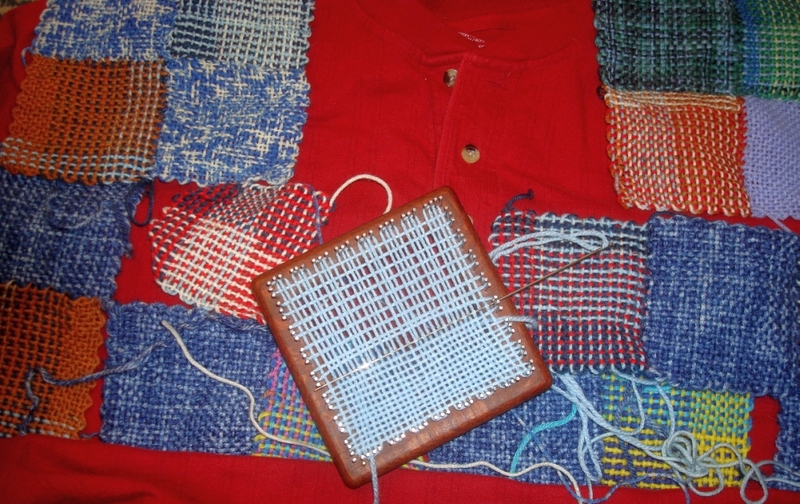 I have a picture file on my computer under Weaving Clothing called Ideas. When I see a picture of a garment- sewn, knitted, whatever- that I think I could possibly make with the looms, I save it in this file. Of course, there are many more ideas than I’ll ever have time to make so I thought I’d share a few “Inspired by” here to give you an idea. And there are lots for the smaller looms. This one would be pretty easy. If it’s your project, I have to thank you for the inspiration, I don’t remember where I saw it. 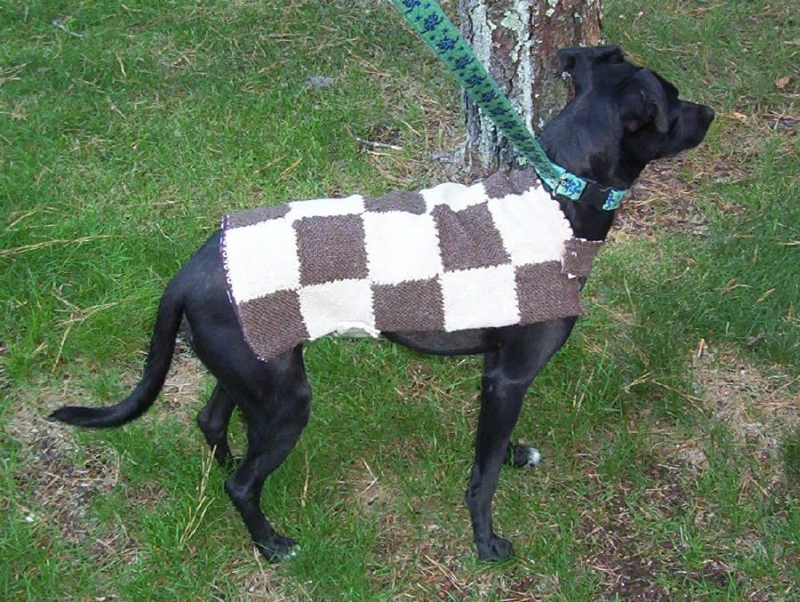 It was Multi woven, the 4″ I believe, but if you have a big dog it could also be done with the 6 inch or one of the Quilt Weaver squares. If you’re looking forward to summer and have the ‘figger’ for it, here’s a pretty simple top for hot weather. Your teen could wear this. The woven blocks should be a fairly tight and modest fabric but would still be lighter and more comfortable than this crocheted version probably would be. Something like a soft cotton or one of the bamboo, silky yarns might be good. 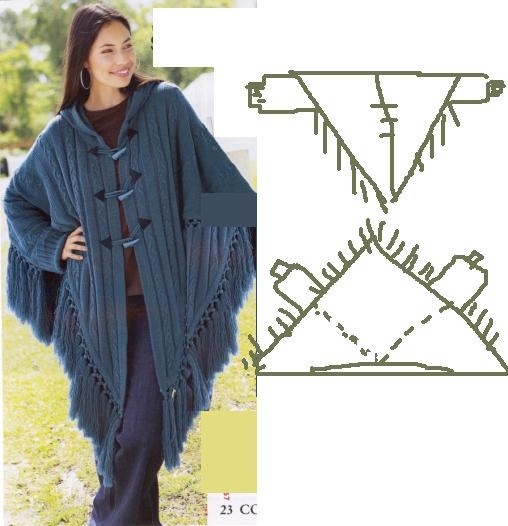 Just something to think about while I am weaving for this tunic. 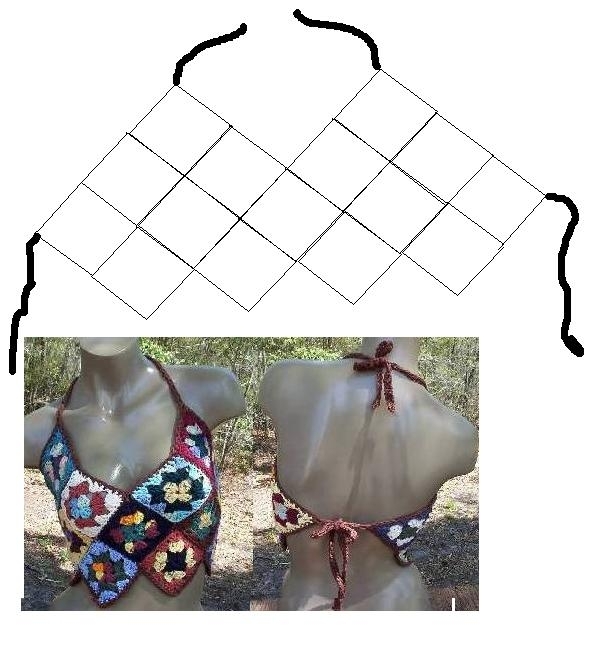 Make your own file, & teach yourself to think in squares and triangles while looking at clothing. 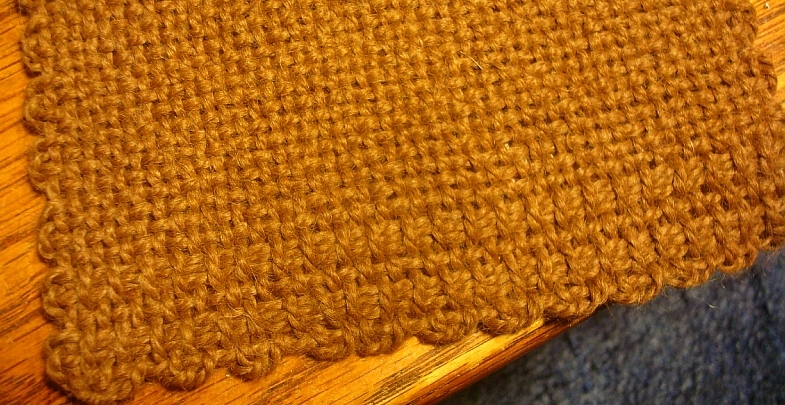 Get out your stash of already woven squares and spread them out and get inspired! A weaver in Oregon sent me these little SweetHearts she made using our loom. She felted them and then added a beaded edging to them. 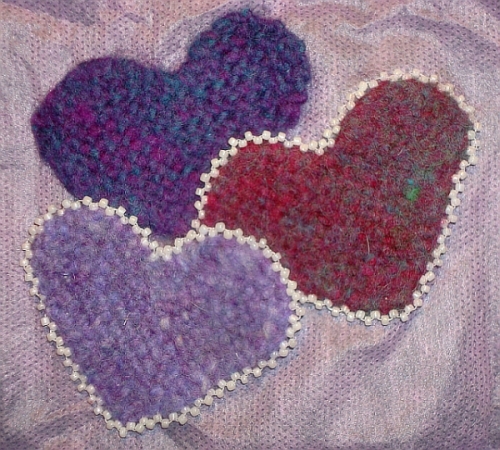 I forgot to ask what yarn Kathy used, but I’m guessing it was a fine yarn as the hearts are light and thin, delicate and so pretty! She says she gave some a pin back to make wearable valentines. Great idea! 2. 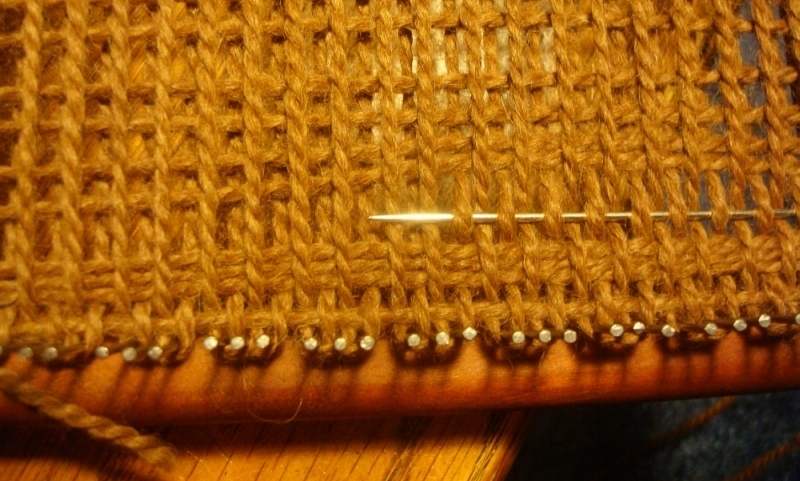 Under 1, then slip the needle across between the layers of warp and go under the last one. 4. Repeat row 2 and them weave the rest of the block plain. Day started out raining, now it’s just cold and gloomy so I think I’ll build a fire and sit and weave today. Okay, here it is. It took some finigeling but I think I got it. 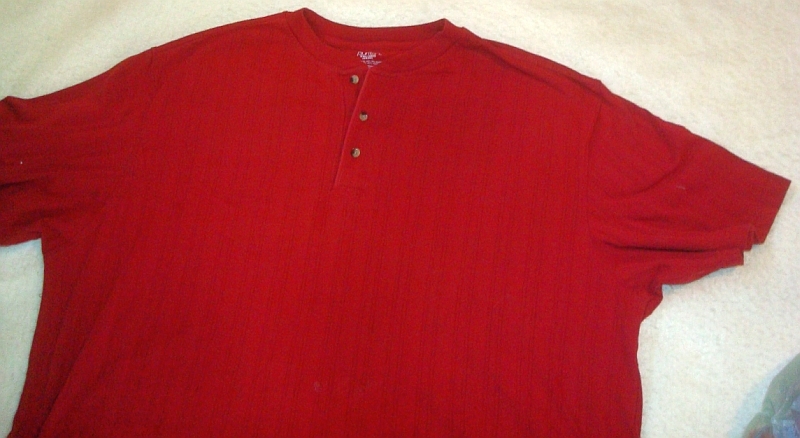 It’s still a bit too wide at the shoulders, but then the original shirt also was. I ended up making darts in the back of the shoulders which helped some. I like it much better than the original shirt, in any case. 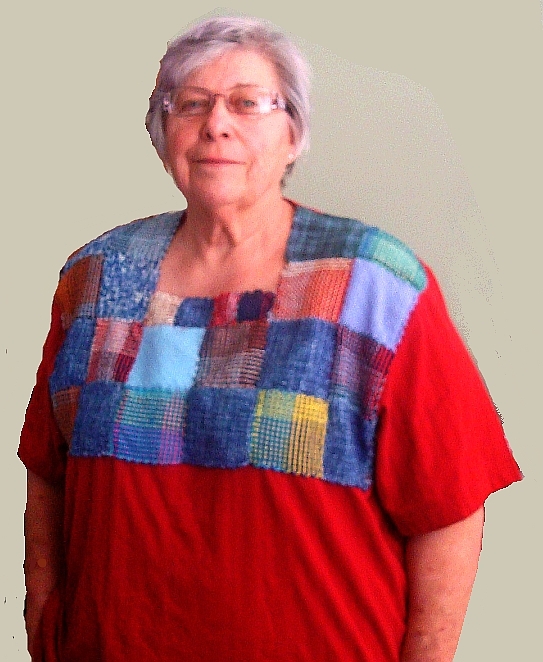 Had to add a row on 2″ squares out of the bag at the neckline as it was a bit to low for the high cut sports bra which is my favorite. But I think they are kinda cute, anyway. So here’s the next steps. Mine- & you can see where to avoid this many with a little planning on yours! 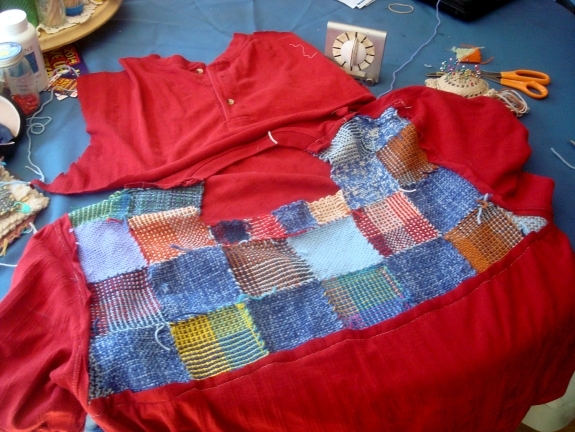 Pinned the patchwork to the shirt at sleeve seam and shoulder. Then top-sewed it down. >>> Then took out the shoulders because they were too wide. Sewed the dart in the back and the re-pinned and top sewed it again, easing the blocks. 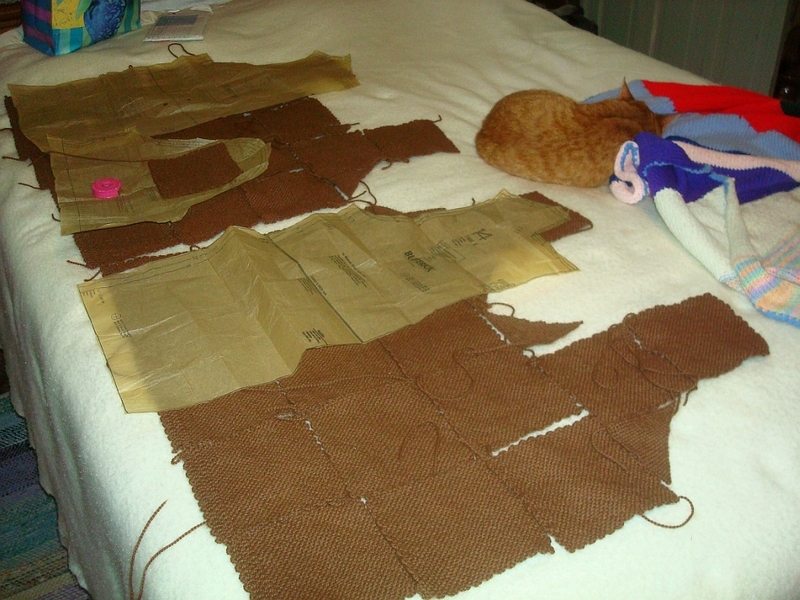 I also pinned and top sewed the bottom of the patchwork. 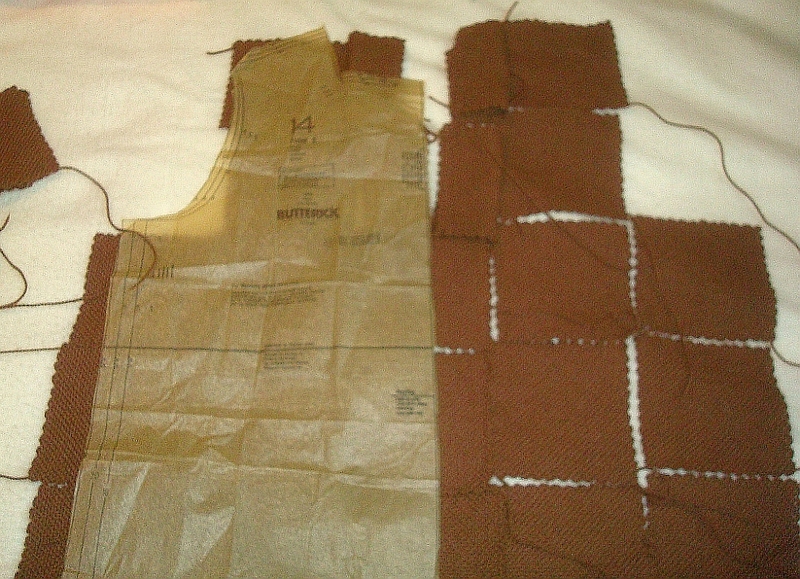 Then I cut out the section of the shirt under this leaving a half inch of “seam allowance” in case I needed it. You never know. I hope you can tell that this is inside-out here. And now it’s done. I am pleased with it, all in all. 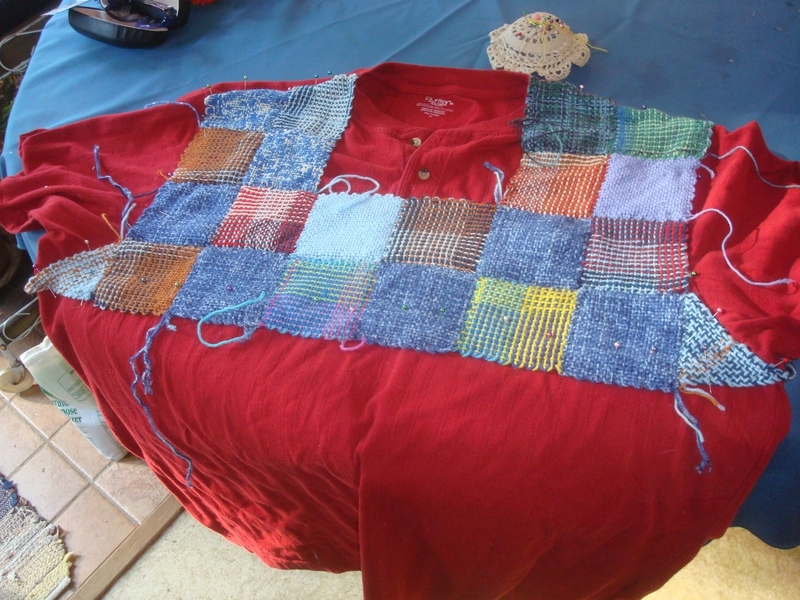 Used up a bunch of squares out of the misc bag and have a colorful shirt to wear this summer just by remodeling one I already had and didn’t wear. Meanwhile, I am still weaving for the tunic. But there are more blocks in the misc bag, too…. Just wanted to add a note here. I tossed this one in the washer with the regular laundry and it came out just fine. May have fulled a tiny bit but no shrinkage or distortion, not unraveling. Did just fine, which pleases me no end! I am still weaving squares for my tunic but thought I’d do something with this bag of little ones, meantime. I think I mentioned that I’d… Had An Idea! So I worked on it a bit today. Inspired by this shirt I found in the bottom of my drawer. Don’t know why I bought this, it’s an ugly man type shirt. Well, it’s red. I have a hard time resisting anything red. Laid out my blocks on it. Found a couple wool ones and had to replace them as this will be tossed in the washer if it turns out wearable. Had to go so far as to weave one replacement. but I got them all assembled! Not too shabby and I still have the evening to weave on the tunic. But now I’d better go tend the spaghetti before Himself starts getting grumpy.